Head over to get a Set of 2 Mermaid/Fishtail Freezer Pop Holders for ONLY $5.99 (Retail $14.99)! Enjoy those hot summer days and cool frozen treats! Tired of wrapping your kids frozen pops in paper towels? We've got you and your pops covered! Our amazing neoprene freezer pop covers stretch to fit any frozen pop or yogurt stick, keeping those tiny fingers from getting frozen. This also means less melting, which mean less mess! WIN!! 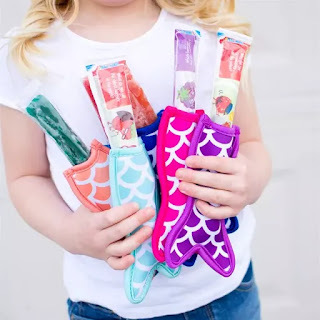 Made from very stretchy neoprene, these extra roomy pop holders will hold every size of frozen pop with ease, which makes it easier for small hands to hold onto, all the while allowing enough pop out the top. These are a hit with kids of all ages and also make fabulous party favors! At this amazing price, be sure to grab a couple packs and keep those kids cool with their favorite frozen pops this summer!